Friday’s Fresh Five! (2/5/10) | What about this? Despite the soggy weather, my daffodils are beginning to bloom. These beacons of cheer brighten the dreary landscape. 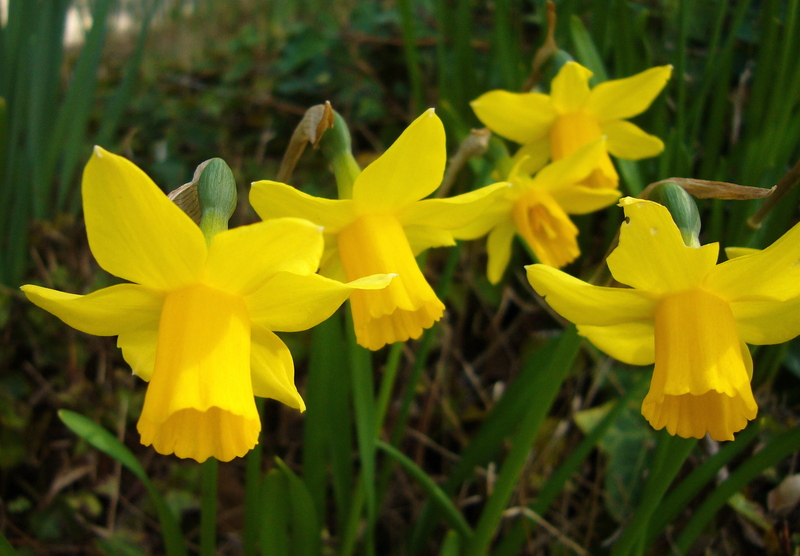 Read about how your gift of daffodils can help brighten other people’s lives. Proceeds from the American Cancer Society’s Daffodil Days program not only raise funds, but give hope to people facing cancer. According to the American Cancer Society, Daffodil Days “is about more than just giving beautiful flowers: it is everyone’s opportunity to create a world with less cancer and more birthdays where cancer never steals another year from anyone’s life.” Please give a gift of hope by donating to this worthwhile event. This information just in from one of my co-workers! A few months before I posted My Most Requested Recipe in September, a co-worker asked me for it so she could prepare it for her husband. He’s been eating steel cut oatmeal for breakfast every morning since then. Says my co-worker of her husband, “He was waving his lab report around like it was a medal.” The eighteen point drop in his cholesterol was quite significant. His current cholesterol levels have gone back down to his 2006 levels! When buying bananas, look for medium-sized ones without any bruises. Avoid those that have a greenish-purple tinge as those will never ripen to a golden yellow. The greenish-purple tinge indicates that they have been refrigerated at some point in time. They are okay to eat, but will not taste as good. * 544,000: Trees saved if every household in the United States replaced just one roll of virgin fiber paper towels (70 sheets) with 100 percent recycled ones. * 20 million: Tons of electronic waste thrown away each year. One ton of scrap from discarded computers contains more gold than can be produced from 17 tons of gold ore.
* 9 cubic yards: Amount of landfill space saved by recycling one ton of cardboard. * $160 billion: Value of the global recycling industry that employs over 1.5 million people. * 79 million tons: Amount of waste material diverted away from disposal in 2005 through recycling and composting. * 5 percent: Fraction of the energy it takes to recycle aluminum versus mining and refining new aluminum. * 315 kg: Amount of carbon dioxide not released into the atmosphere each time a metric ton of glass is used to create new glass products. * 98 percent: Percentage of glass bottles in Denmark that are refillable. 98 percent of those are returned by consumers for reuse. * 51.5 percent: Percentage of the paper consumed in the U.S. that was recovered for recycling in 2005. Bring cheer to someone’s life this weekend! Linnell, I love your blog! Since I am late coming to the party, I could spend hours reading all of your archived posts, as well. I wanted to particularly comment on your Daffodil Days link. I am leading the charge, once again, with the campaign here in south Placer County and was so thrilled to see it appear in your post today. The Gift of Hope aspect of Daffodil Days is particularly near and dear to my heart since I was a recipient of a beautiful bouquet during my chemo 9 years ago (a big “praise the Lord” for 9 years!!!!). Thanks so much for helping to spread the word and the hope that it brings. We ARE going to find a cure! Thanks Laura! You are an inspiration and blessing to so many of us. No thanks needed – I’m glad to be able to help spread the word about Daffodil Days and the Gift of Hope. Yes, we ARE going to find a cure!